Before designing their products, Yeoman Gear conducted their own survey of male yogis and found that over 90% felt that yoga mats were too small. More than 95% of the men surveyed agreed that yoga blocks were also not large enough. “That convinced me of the need for these items and solidified my decision to launch Yeoman Gear products.” says founder Tom Nardone. He has been practicing yoga for over 15 years and always thought the products weren’t made for him. It wasn’t just the pink and purple pastel tones, it was the size of the items. “The combination of a small mat and a large yogi leads to a lot of readjustment during class. It can ruin your flow. I was jealous of the smaller people who didn’t have to shuffle around as often.” says Nardone. Yeoman Gear gives larger people more space to work with. The mats are described as one head’s length longer, one hand’s width wider, and twice as thick. The Yeoman Gear Block is more than twice the volume of a standard yoga block and allows less flexible people more stability. Can larger yoga equipment fit in a crowded classroom? Yes. Yeoman Gear is just slightly larger, just like average men are slightly larger than average women. Early users of the mats say that their neighbors didn’t seem to notice the difference. What about price? Fortunately, this larger yoga gear is really affordable. The Yeoman Gear Mat is just $39 when you pre-order via Kickstarter. You can add the block for $15 more. A deluxe package of Yeoman Gear which includes the mat, block, strap, and mat cleaner spray is only $69. 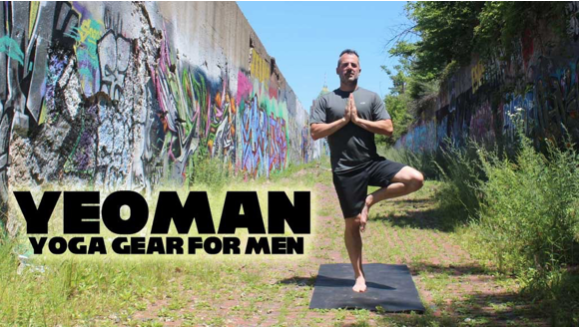 Compared to premium yoga equipment, Yeoman Gear is a bargain, especially for men.